This is an abstract board game about moving tiles and reaching the center of the field. More specifically it is a symmetric 2 or 4-player game with perfect information. 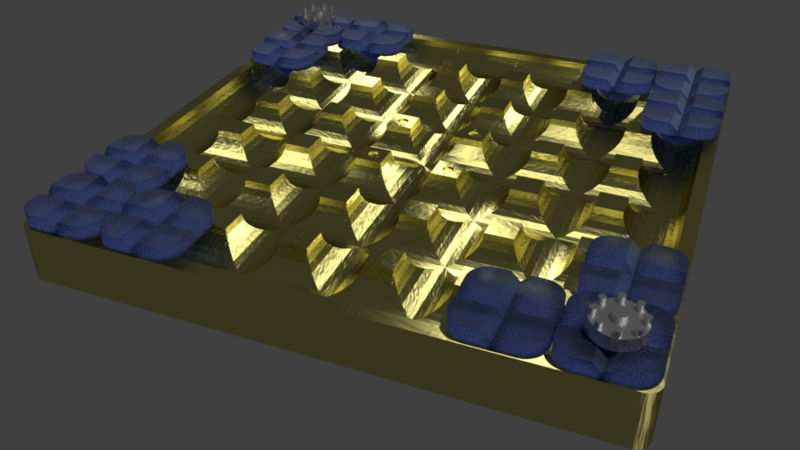 For the standard configuration (seen in the rendered image), 1 game board, 2 player pieces and 12 ice floes are needed. How I made my boardgame (respectively how you can do it). - Prototyping has been done both in Processing and in Puzzlescript (the demo you can play below). - The pieces have been designed using Google Sketchup and Blender. - The rendering has been done in Blender (anisotropic filtering in gold with random noise for metal look, rough blue glass for the ice floes and a generic material for the player pieces). - The conversion from STL to GCode for 3D-printing was done using my slicer software (This step is obviously optional :-). - The final 3D-print was made on an Ultimaker 2. You and your opponent are currently on fields that move through ice. The objective of the game is to get into the center of the playing field, the goal field. Since the standard field is symmetric it doesn't matter who starts, after each movement the sides are switched. A player must move! Choose any direction (up, down, left or right) in which no other player is standing directly adjacent and in which you have not reached the edge of the map. If you move in a direction where another ice floe is adjacent to yours, you have to move from your ice floe to the one your moving to and your turn is over. If you move in a direction where there is no ice floe, you will move until you hit another ice floe or reach the edge of the map and your turn is over. You win whenever you are standing still on top of the goal, not gliding through it. You can practice the legal moves in this 1-player simulation of the board game (move using arrow keys, z to undo a move, r to restart) here. Start by pressing ENTER, move using the arrow keys, press R to restart, press Z to undo a move (holding Z after pressing ENTER at the beginning will increase the size of the game). You can change the field (size and position of ice floes/players) at the end of the file here. Legend for editing the level: . is water, * is an ice floe, P is player 1, Q is player 2. A 4-player version can be played here (turns are counter-clockwise). As soon as someone cannot move because he is trapped by other players, he is eliminated (taken away) from the field and looses.